I was throwing a dessert party for a couple of friends who were moving to Utah last week (we miss you already, Alison and Ryan!!). Everything was under control, and I was going to have all of the desserts ready in plenty of time for the party. I had already made a strawberry shortcake, and my brownies were cooling on the counter. I went to flip the brownie onto a plate… and it came out mush! I don’t know what happened… maybe the oven had gotten turned off, or I messed up the timer, I’m not sure. I love my brownies a little gooey, so I didn’t think anything of it when I took them out of the oven. These, however, were un-servable. What do I do next? 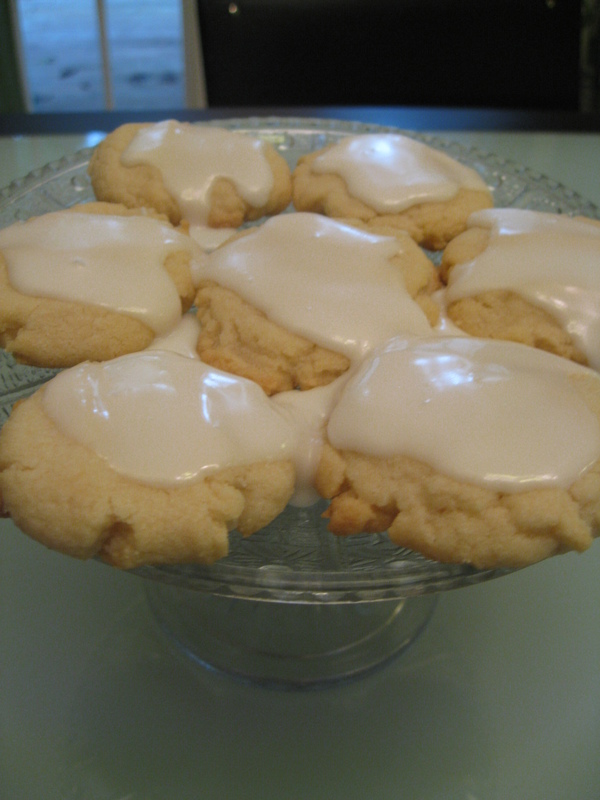 I opened up my cooking notebook and flipped to the page for almond glazed sugar cookies, and settled on them immediately. I put the butter in the microwave, went to scoop some flour in the bowl… and I was out of flour! I’m never out of flour. I usually have multiple bags in the lazy susan (hehe, I love that name). Forty five minutes before the party was to begin, I ran to the store, picked up some flour, and by the time people arrived the cookies were on the plate. These cookies have an amazing almond flavor in both the cookie and the icing and were definitely a hit. It is not a typo in the recipe – you do not need eggs – it makes them extra flakey and delicious. So, the next time you are in a bind because your brownies did not cook, or you don’t have any eggs, try out this recipe. You won’t be disappointed. Citation: My best friend in college, Alison Shermeta, gave me this recipe. Her mom used to make them – both she and her mom are amazing cooks, and these cookies prove it. Alison has the most beautiful food blog (http://threehundredfiftydegrees.wordpress.com/). Drop by spoonful onto cookie sheet. Then flatten with a buttered glass dipped in sugar (or use your fingers to flatten). Cool 1 minute and remove from cookie sheet. Cool completely. Decorate cooled cookies with glaze as desired.